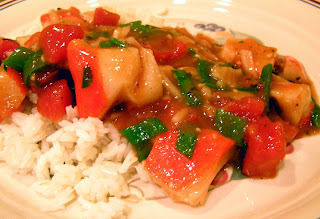 Chesapeake Étouffée -- is that a great name or what? Rachel from Coconut and Lime, who titled this dish, is just sooo creative! If she had called it crab stew, I would have totally bypassed it. According that culinary expert, wikipedia, étouffée is a thick stew usually made with shellfish such as crawfish or shrimp. It can even be made with chicken. Rachel's recipe calls for crab meat and crab stock. My more kosher-friendly version uses "crab" surimi and onion bouillon, yet still is quite tasty. Everyone and their mother is posting Thanksgiving recipes. So in an effort to join the party yet be unique, I'm just going to post a list of perfect desserts. Because desserts are the most important part of Thanksgiving. Not the turkey. Dessert. When you push yourself away from the table, kvetching about the vast quantities you consumed, are you patting your stomach while thinking, "Gee, that was the best turkey in the world"? Noooo ... through that food coma haze, your brain is reliving all those vast quantities of desserts you ate, right after pleading, "No, no, really, I couldn't eat another bite ... ooh, pie ... well maybe just a sliver ..."